2012 Spring League is over!!! Congratulations to #bowlessucks on winning LUDA Spring League 2012!!! 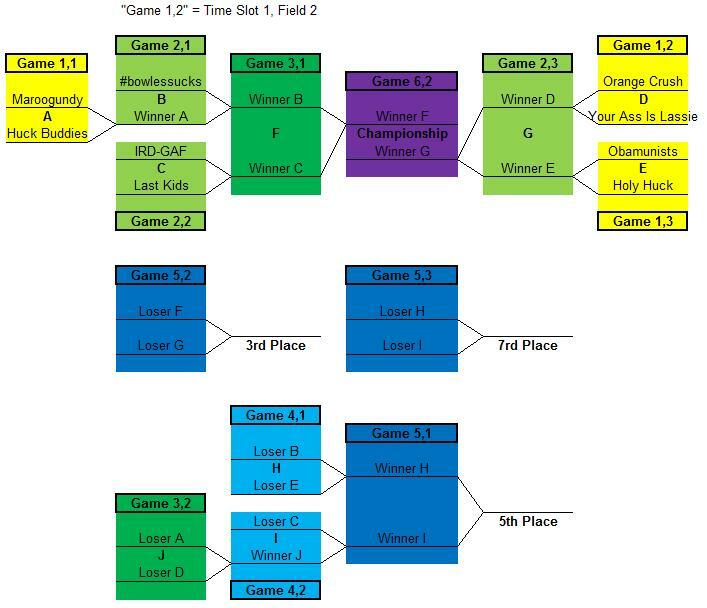 Games are on the 17th & Vine turf fields, and will be played under the stadium lighting. Registration fee is $30/player, and covers field rentals, swag, and the after party. Due 2nd night of league. Players must be 16 years of age or older. Younger players will be considered on a case-by-case basis. Carbon flip dictates first choice of possession or side: team with fewest players who drove to league gets first choice. Games are to 13 soft cap, 15 hard cap. Halftime at 8. Time capped at 70 minutes. Field entrance is along the South-West corner of the field (red dot). Metered parking is available on 17th St, 16th St, 14th St, and the parking lot on the corner of 14th & W (orange lines). Street parking is available along 19th street (lavender lines). DO NOT PARK in the parking lot to the South East of the fields - it is reserved for UNL students with parking tags only.